Curse him for giving Rockman such a cheese-fest name. Heh, EVERYTHING was "Super" at the time, no wonder they assumed that. Kinda like how a lot of games for the DS came out with "DS" on the end or some kind of acronym spin off "Dual Sympathy, Dawn of Sorrow, Deadly Silence, etc..."
The Trons of the 80's and the Supers of the 90's. @Anon #1 And Rockman isn't? Is sounds like a rejected name for the Fantastic Four's The Thing. Still,I don't like the fact he changed the name simply because he didn't like it. @Anon 1: Let's be fair. When I heard the name "Rockman" for the first time, I didn't automatically think "rock n' roll". That was an interesting read. 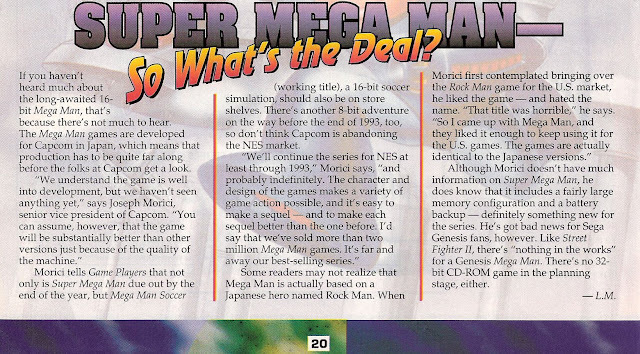 I wonder who else remembered Megaman 9 when he said "indefinitely" in regard to NES MM titles? I think it's funny that "Rock," "Blues," "Forte" and "Gospel" got edited names, and Dr. Light's name was modified, but other characters' names, like Roll's, remained the same, keeping their musical-themes. Also, Changing Forte to Bass and Gospel to Treble didn't really change all that much...I've always thought that changing Rock over to Mega, though, loses some of the naming conventions of the series, but I could go on and on about that. Still though, I think there were marketing factors at the time that came into play here. I thought it was interesting that he talked about continuing the NES series indefinitely (obviously beyond Rockman 6), and even though that game itself was due out in 1993, it didn't come to the U.S. until 1994, and wasn't even released by Capcom! Sure, other 8-bit games were made (MMV was pseudo 8-bit and MM9 was NES in spirit), but the NES series kind of died at that point. Still, this was a nice find! It seems the mystery has finally been revealed. And I always thought it had to do with Sony's Rockman. So hes the one responsible for the whole megaman name thing. bring out the pitchforks guys. Too bad the megaman name is really popular. Even with non-gamers it's recognizable. Trouble is, people hear the cheesiness in the name and automatically think of the 80's games. Yes, they were good, but people resign newer Megaman games to shovelware (And no, they aren't shovelware) and big wigs of decades past. It stinks. Character name changes have happened before, but there's that whole amp thing and the fame of Mega's name. I really wish they'd kept Rockman. In fact I wish all the characters in all the Rockman games kept their original names. When you import things from other countries you should be allowed to keep their original names, even if there is already something named similar in the US. that's so very true. At my age, people find it silly I'm a huge Mega Man fan because they think of Mega Man as a kid thing. I usually don't even bother trying to explain. The name Mega Man is kind of generic sounding. That doesn't mean that it makes Mega Man worse or anything. I mean look at Superman. Rockman doesn't sound as generic, but it isn't the most original name ever. I like both. I think that Light>Right, Protoman>Blues, Forte>Bass. Gospel and Treble I like equally.